Electrolux Range/Stove and Microwave Installed... and LOVING them! Yay, they are finally here! Check out how 'purdy' the new Electrolux Appliances are... eeek! Yes, Electrolux sent us a matching microwave as well! This Electrolux range and oven are BEYOND fancy. Cason and I spent almost a whole hour reading over the owners manual. Ooo-ing and Ahh-ing over all the cool features. I have to be honest... And I'm probably saying this out of ignorance, due to the fact that I haven't really had the "FULL experience" with my stove/range, yet. The FLAT, no-knob-ed wave touch controls!!!! But want to know why I REEEEALLY love them? When it's time to clean up splattered sauces, or dried on starchy spaghetti noodle water from my control panels, I no longer have to maneuver around knobs, to get things clean, OR pull knobs off to scrub them down! ha! Yes... It's the simple things in life, that can please an OCD clean freak, such as myself. I'll be back tomorrow, to share with you the first yummy recipe that we whipped up with our fancy schmancy new stove! This is part of a series of six posts, sponsored by Electrolux as part as HomeBuzz. I am receiving an Electrolux appliance in exchange for my participation. The opinions stated in these posts are all mine. 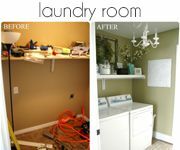 Check out Elyse's laundry room transformation! She's a brand new blogger, (as of a few weeks ago) and in my opinion, has some SERIOUS style. 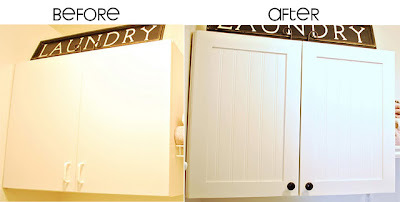 I'm DYING over her idea for "doctoring" up cheap-o cabinets! Ohhhhhh pretty! They look so nice! How FUN! Shelley thank you thank you thank you for the cameo!! You are so sweet,you increased traffic to my blog by 100%! And I am sooo jealous of your new appliances! 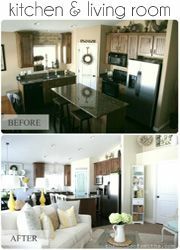 I NEED those new appliances in my kitchen, they would really help complete the makeover that we just "finished". LOVE the new appliances! Would love to be a tester for them! How did they choose you? Oh my gosh! I'm so jealous! I want them! I Love your kitchen! 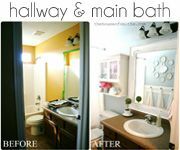 I so know what you mean about being a OCD clean freak...that is so me! Congrats on the new stove and microwave! Can't see what you made! I'm totally drooling over your new appliances! Nice :) Have fun! 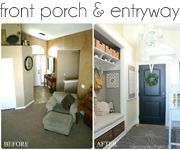 Wow they make a big difference. Just the difference I need in my kitchen too! I keep seeing other bloggers popping up with free stuff from them, thats a band wagon worth hopping on for sure! Where do I sign up?? I just found your blog a few days ago, quite by accident, and it's great! AND...you made me giggle out loud this morning when I peeked in here, because we just built a house two years ago, and the reason that I chose the cooktop that I did (sadly, it's NOT an Electrolux!) was because it had streamlined knobs and was VERY EASY TO CLEAN! THAT was the selling point for me! I didn't care how it cooked. I didn't care what it looked like. I didn't care how energy efficient it was. It had easy-to-clean surfaces with knobs that JUST GOT OUT OF THE WAY, and I was sold! And that, dear, is why I just burst out laughing at your blog this morning! I didn't think any other neurotic stovetop cleaning people existed beyond myself! 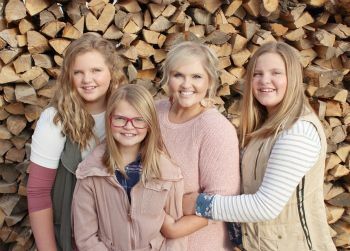 I love your blog, and your daughters are darling. We just have one ten-year-old boy, and I love him to pieces. He's cute and sweet and wonderful and absolutely perfect, but when I saw your pictures on dressing up for a tea party in the big city, I was almost envious! A girl can only take soccer and Star Wars and Lego bricks and frogs and dirt for so long, before she wants everyone to wear a pretty dress and drink tea WITH MANNERS!! Keep up the good work on the blog. And someday I'm going to invite you over for a cup of coffee so that you can decorate MY house! WOW....I love your new appliances!!! I also LOVE your blog!! I am so jealous! 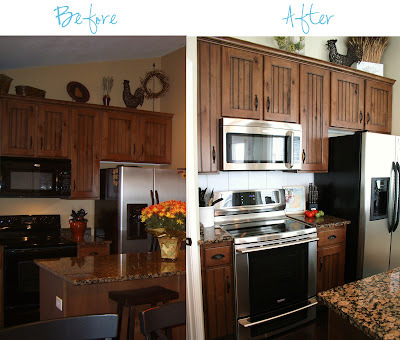 (Been wishing for those appliances)...they look so good in your kitchen. Enjoy them! Your stove looks fabulous!!! I bet you are just loving all the cool things it can do. I am so excited for you!!!! Ow ow! Those appliances added just the right bling to your cute kitchen. Love it! i'm so excited for you! how awesome does that look in your kitchen. you go girl. pretty cool that they gave a microwave as well.